Situated at the end of a 500m causeway protruding into the Arabian Sea is the whitewashed Haji Ali Mosque, containing the tomb of a Muslim saint Haji Ali who is believed to have meditated on these very shores. It is said that Haji Ali was a wealthy Muslim merchant who renounced all his worldly belongings before embarking on a pilgrimage to Mecca. He died in Mecca and the casket miraculously drifted and came to the spot where the mosque and tomb were built by his devotes in the early 19th century. The Mosque lies opposite to the famous Mahalakshmi temple and can be approached from Lala Rajpatrai Marg. Haji Ali is a handsome example of Islamic architecture standing on an island. In fact, this holy place is visited by many devotees as well as visitors who are attracted by the beauty of the site. The widespread belief is that whoever prays to the deity here is never disappointed. A number of pilgrims come here for thanksgiving. Haji Ali's sister also followed her brother's footsteps and became his companion in ascetic suffering. There is a mausoleum built for her a little distance away on Worli Bay. The mosque has a narrow concrete pathway about a kilometer built over water to reach the shrine and can only be reached at low tide. The walkway is lined with pitiful wailing beggars. A short flight of marble steps leads into the dargah where the body of the saint is enclosed in a semi-circled tomb,in an exquisite silver frame engraved with all the ninety-nine names of Allah. The top of the tomb is covered with a zari cloth and flowers and other offerings by devotees lie scattered around the tomb. The devotees pray and touch their heads and lips to the cloth. Ladies, as is the case in all mosques, have a separate room for prayers. All visitors need to remove their shoes before entering the shrine. During high tide the walkway to the mosque is submerged in the sea making the impression that the mosque and the tomb are floating in water. Check the tide times in the local paper before visiting. The courtyard of the mosque is surrounded by refreshment stalls and other kinds of shops which take away the solemnity of the place. 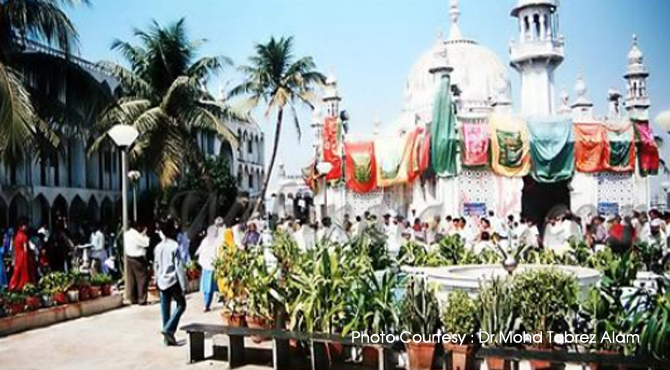 Haji Ali is dargah is an integral part of Mumbai’s heritage and Indian culture. The rocks exposed at low tide behind the mosque are a favourite spot if you are interested in catch sea breezes. The best time to visit is on Friday or on Thursday evenings.